I have the pleasure of owning an old T23 laptop. To show you how old this puppy is, the current T series is at T60, and those have been out for over a year. This laptop was made in 2012, and I picked it up somewhat discounted late in 2003. It is now March 2007, and this puppy is still rock solid. You heard me, it is almost six years old and still working fine -- that is testimony to how well this laptop was built. There are several small cracks around the case, but nothing you would notice by just walking by. This laptop has been to more countries than many people. I had the first problem this weekend, and it isn't even related to the laptop. The hard drive, a 30G I put in at some point, started to crap out on me. 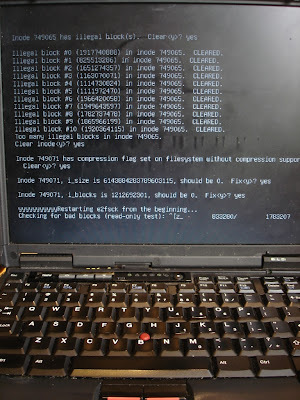 Bad sectors were everywhere, so some of the programs were slightly unhappy (e.g. I couldn't boot into X). I'm going to buy a new laptop soon, I promise, about the time my MBA goals are reached. Until then, I'll continue to be frugal, and deal with the bad sectors. Being a good IT nerd, everything is backed up to an external hard drive (and most stuff backed up remotely). Luckily I'm using Linux -- so was able to runs fsck/smartmontools a few times in recovery mode, make the bad blocks happy, and continue as "normal." Phew, disaster averted.